The 27.5% rates applies through 2019-20. The general company income tax rate is 30%. Tax rates for small business companies with aggregated turnover below $50 million are being progressively lowered to 25% by the 2021-22 year. Arising from the 2016-17 budget (see more below), the small business company tax rate was reduced to 27.5% from 1 July 2016 (for the 2016-17 year) along with an increase in the qualifying turnover ceiling to $10 million. The ceiling moved to $25 million from 1 July 2017, and to $50 million from 1 July 2018. From 1 July 2017 a passive income test was introduced as described below. To be a Small Business Entity eligible for the initial tax rate reduction from 30% to 27.5%, a company must be carrying on business in its own right. 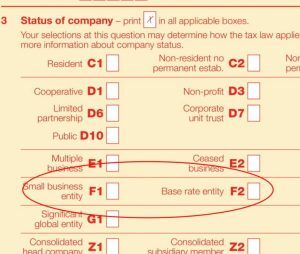 The company tax return forms require specific SBE confirmation in order for the lower tax rate to be applied. Ruling TR 2019/1 provides ATO commentary and clarification of when a company is considered to be “carrying on a business”. Commencing from 1 July 2017, companies eligible for the lower tax rate must be “Base Rate” companies. In order to further define the scope of eligibility, the Government confirmed that passive investment companies were never intended to be eligible for the tax rate reduction, and subsequently passed legislation (see below) which sets out an “80% test” to support this policy intention, included in the definitions of “Base Rate Entity” and “Base rate entity passive income“. The Treasury Laws Amendment (Enterprise Tax Plan Base Rate Entities) Bill 2018 (now law) provides a “bright line” test for corporate tax entities to qualify for the lower corporate tax rate. The carrying on a business test is replaced with a passive income test, under which companies that are generating predominantly (i.e. 80% or more) passive income will not be eligible for the lower (less than 30%) corporate tax rate. Base rate entity passive income (“passive income”) is defined generally to include dividends, interest, royalties and capital gains. Non portfolio dividends paid to a holding company (a minimum 10% equity requirement) are not treated as passive income. Amendments to the Bill further clarify that the interest income of various kinds of registered financial services entities is excluded from the passive income definition. What is the Company Tax Rate? And what is the Imputation Rate? The amendments are to apply from 1 July 2017 for the 2017-18 year onwards. As a practical measure, the ATO has advised that for the 2016-17 year companies will not be selected for audit “based on their determination of whether they were carrying on a business in the 2016-17 income year, unless their decision is plainly unreasonable”. the aggregated turnover of the corporate tax entity for the income year is less than the aggregated turnover threshold for that income year. Announced as part of the Federal Budget 2015 and now law, from 1 July 2015 the tax rate for Small Business companies was reduced to 28.5%. Before 1 July 2016, Small Businesses Entities were those with aggregated turnover (i.e. grouped with related entities) of less than $2 million. The 2016 Budget contained proposals for reducing company tax rates. Initial amendments brought to parliament were to have extended rate reductions progressively to all companies. Through negotiation in order to secure passage of the legislation, this was modified to limit the tax rate reductions to “base rate” companies, progressively extending from small business entities to entities with aggregated turnover of less than $50 million. The consequence of this limitation is that the corporate tax rate for entities with an aggregated turnover of $50 million or more remained at 30%. The Treasury Laws Amendment (Enterprise Tax Plan) Bill 2016 has been passed by the parliament, and operates from 1 July 2016. In addition to the modified 2016-17 budget reductions which have already passed through parliament (see below), government policy was to further reduce the corporate tax rate for all companies to reach 25% by 2026-27. However following defeat of the Treasury Laws Amendment (Enterprise Tax Plan No. 2) Bill 2017 in parliament the Bill was abandoned. * Historical company tax rates, and for other entity types, can be found here. 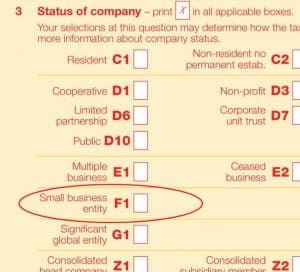 Aggregated turnover of an entity is a term which is defined to include the annual turnover of an entity for an income year, and to which is added the turnovers of any entity which is “connected” or “affiliated” at any time during the year, for the period they were connected or affiliated. “Turnover” refers generally to ordinary income. The Treasury Laws Amendment (2017 Enterprise Incentives No. 1) Bill 2017 gives effect to a modification of the same business test, (which qualifies the applied to the deductibility of prior-year company losses), by replacing it with a ‘similar business’ test from 1 July 2015. TD 2018/12 Income tax: schemes that limit a taxable presence in Australia under section 177DA of the Income Tax Assessment Act 1936 – meaning of ‘directly in connection with’. PCG 2017/1 ATO compliance approach to transfer pricing issues related to centralised operating models involving procurement, marketing, sales and distribution functions. TR 2018/5 Income tax: central management and control test of residency. The laws previously provided for the retention of a universal maximum franking rate of 30%. After the tax rate reduction, the maximum franking rate is to be 27.5% or 30% if aggregated turnover for the previous income year is equal to or exceeds the current year threshold. ATO: Rate change for franking credits. Early-lodged 2016-7 returns may need to be amended. Due to the changes surrounding the taxation of companies the Tax Office has released guidance documents. Practical Compliance Guideline (draft) PCG 2017/D7 – provides guidance in relation to potential over-franking of dividends in the 2016-17 year for which the tax rate was reduced from 30% to 27.5%. The tax rate for a Public unit trust is also 30%. The Exploration Development Incentive (EDI) enables exploration companies to apply exploration tax losses towards tax credits for shareholders. Australian resident shareholders that are issued with an exploration credit are entitled to a refundable tax offset or additional franking credits. Eligible companies must notify the Tax Office of estimated eligible exploration expenditure by 30 September. Due to the late passage of the enabling legislation, amendments were included to extend application period for 2017-18 year to 15 May 2018. The Junior Minerals Exploration Incentive (JMEI) is to provide a tax incentive to invest in small minerals exploration companies undertaking greenfields minerals exploration in Australia. Australian resident investors of these companies receive a tax incentive where the companies choose to give up a portion of their tax losses relating to their exploration expenditure in an income year. credits available per entity are limited to 5% of the total amount available for each year. Legislative amendments to remove the carry-back availability from 2013-14 were included with the Mining Tax repeal measures and took effect from 30 September 2014. See MRRT Repeal Measures Bill. The ATO provided for a “no-penalty” administrative treatment for companies which may have already claimed for 2013-14 in accordance with the then-existing law. Tax assessments are automatically adjusted by the Tax Office to reflect the repeal. From 1 January 2014 corporate tax entities are required to make PAYG income tax instalments monthly rather than quarterly if they are over the specified turnover thresholds. These changes were foreshadowed in the Treasurer’s 2012 MYEFO. will remit their PAYG company tax instalments monthly from 1 January 2014.
will commence monthly payments on 1 January 2015.
will commence monthly payments on 1 January 2016.
will commence monthly payments on 1 January 2017. Benchmark Interest Rates for Div 7A loans.